Pointer (canis avicularis), a well known sporting dog belonging to the race of hounds, which it resembles in general aspect, character, and colors. Though frequently called Spanish, and probably introduced by the Phoenicians into western Europe from Spain, the breed is generally believed to have originated in the East. Their habit of standing fixed and pointing to game is the result of a long course of severe training; and, from the succession of generations educated to this purpose, the faculty has become innate to such a degree that young dogs of the pure breed point with scarcely any instruction; good dogs have been known to stand pointing for an hour at a time. 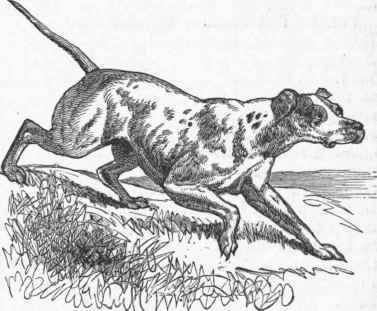 When shooting supplanted hawking and coursing, in the latter part of the 17th century, the pointer and other trained dogs took the place of the more powerful, fiercer, and swifter hounds. The hair of the pointer is smooth, sometimes marked like the foxhound's, but generally with more spreading dark colors; and some of the best breed are entirely black. The thoroughbred Spanish pointer has the nostrils separated by a deep groove, and their wings dilated and very sensitive.